A soccer rebounder is a fantastic piece of equipment that will enable you to develop a whole range of skills both in team practice and individual practice. Arguably the greatest benefit these training aids is that you can set up soccer rebounder drills that allow you to develop team based soccer skills by working individually which has always been a really difficult thing to do. Without a soccer rebounder it is virtually impossible to replicate the range of skills it is necessary to practice for example, passing, shooting, heading and receiving the ball are all vital skills at any level of football but without a structured practice session and a squad of players it is virtually impossible to expose yourself to the intense level of repetition necessary for developing these vital skills without the support of a soccer rebounder. The first skill anyone learns when playing soccer is how to effectively pass the ball and it is something that all soccer players at all levels continue to practice to make sure they are operating at the right level. Passing is the constant thread running through every moment of the game. When played well soccer is a possession based game, not a territorial game and in order to succeed it is important that you and your teammates can look after possession of the ball with good passing and control. This is an example of a basic soccer rebounder drill that can be used to warm up (It’s always better to warm up with the ball rather than doing something boring like running round the field!). You can get a good feel for your passing and ahead of your game or session if you’ve already made 100 passes from either foot you will have accumulated more touches than other players who are cold and have an advantage. This drill is so simple but it also builds muscle memory meaning you are conditioning your brain to understand the feel of what a good pass feels like on your foot. Like a good golfer who hits his driver on the tee and doesn’t need to look at where it has gone, they can tell from the feel of it, you are training your body to make passes you can deliver with your eyes closed. Although you might want to keep them open if your view is as good as in the video! The great thing about soccer rebound boards is that they enable you to set up a whole host of passing drills that any player can take away with them and practice by themselves. They don't actually need their teammates with them to do the practice. For instance, a simple passing square with players delivering passes on the outside and opening up with their first touch to ensure they play off their back foot can be easily replicated with different soccer rebound boards. Simply angle them correctly and ask your player to bring the ball forward, find the pass into the rebound board and accept on the back foot before moving onto the next one. Three or four soccer rebound boards set up back to back in a working area provides the opportunity to work your way around delivering passes and accepting them on your back foot. You can work your other foot by simply going in the opposite direction. A real benefit of soccer rebound boards is the way that you can work on and develop range of different passing. Whilst they are ideal for short passing they are also really good for drilling long range passes and you can practice a similar drill to above but by making the area in which you work bigger and by striking the ball with different parts of your foot (e.g. laces) it will give you more power although will require more care to achieve accuracy. You can take your passing on a level by using different soccer rebounders to develop different passing drills. For instance you can introduce volleyed passing and the correct technique for doing this well with both side foot and laces. This soccer rebounder will throw the ball back at you in the air enabling you to follow your first pass and return a volleyed pass. The way the soccer rebounder returns the ball to you can be varied using different angles and adjustments meaning you can test a range of control and touches with your soccer rebounders in your sessions. Again it is really useful if your players can make use of a soccer rebounder at home and practice their control in this way. There are some soccer rebounders that will even throw a driven pass up into the air for you to head. When they say that repetition is the mother of all skill this applies to heading the ball more than most aspects of soccer because throwing your head at the ball is such an unnatural thing to do. The more times you can get up and power headers the better you will be. You can perhaps even introduce some cones to dribble around, drive the ball in and then finish with a defensive header if you can angle your soccer rebounder accordingly. This improves all aspects of your game and also your fitness. It is this ability to create realistic game like situations for single practice that I believe make soccer rebounders so valuable to young players looking to make themselves the best players they can be. For instance you can work by yourself to replicate a centre forward dropping the ball back into midfield, receiving back under pressure and then shift the ball to finish into the goal. Without the benefit of teammates taking part in structured practice this simply wouldn't have been possible previously. Watch this video to see some of the drills you can use for passing, receiving, turning and finishing. All the best centre forwards can play with their back to goal and protect the ball to bring other players into the game and most also carry a goal threat in behind defenders too. Being able to practice these skills with great drills like these makes for better strikers. I think the best way to use soccer rebounders is to let your imagination be your guide and let it determine how you can develop as a player yourself or others. Obviously soccer rebounders have great benefits for goalkeepers as well and a number of goalkeeping coaches have been at the forefront of using them innovatively to develop really good sessions. 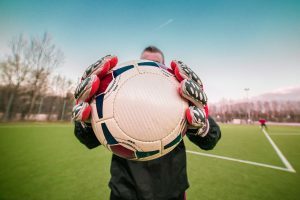 You can test a full range of goalkeeping skills from ground skills required for passing the ball to reflex actions and saving the ball, fitness and even distribution both kicking and throwing. This video is a great example of the ways in which soccer rebounders can be used to develop the full suite of goalkeeper skills. Again this has the benefit of more than one person participating although many of the drills can be replicated on a single player basis allowing for home practice. This is just a tiny drop of the ocean of the many soccer rebounder drills that are out there. As mentioned, when you let your imagination take over you will be able think of many more over and above the examples given here. The important thing it to consider the areas of your game you consider are in need of improvement and work backwards from there. Is it passing, shooting, your first touch or heading that need work? Maybe you just need to practice your all round game. Whatever the situation, soccer rebounder drills give you the perfect opportunity to practice team based skills by yourself to improve. The rest is entirely up to you! How has a soccer rebounder helped you develop your game? Which soccer rebounder do you have and what does it do best?